My husband is a little scared every time he watches me trot off to IKEA while on vacation. I don’t drive ten hours from my home in the Maritimes just to visit my brother in Montreal, Quebec—I drive to shop at IKEA and stay at his place for free. Ssh, don’t tell him. After a few hours, I returned with an armload of the aforesaid stuff—a king sized duvet cover, a couple of curtains, some orange juice glasses, and much more. But the biggest thing I returned with was inspiration. Not to mention the Grown Up Kids of Summer who loll about on the couch and feel neglected without a full meal at dinner. They might be forced to look after themselves for an evening or two. My family and I have lived in a modest home in a quiet, leafy neighbourhood for eleven years. Our children were young when we bought this 60-odd year old house and they’ve spent the majority of their childhood in a place with one bathroom and no family room. We’re a spoiled generation who expects at least two bathrooms so we don’t have to wait to shower or brush our teeth and a playroom so we don’t have to listen to the repetitive music of video games or trip over our kids’ toys. But despite living in close quarters, we still like each other. It’s a good sign. We’ve updated a few windows, added insulation and a new heating system—you know, boring save- money-type things, but when it comes to the way it looks, we’ve changed some cosmetics, not the bones. I had three problems regarding the kitchen, though. Whoever owned our home before us had the brilliant idea to cut out the end of the built-in cupboards and squeeze the fridge in there, wedged in by a window. This ensured that no matter what kind of fridge was there, you’d never be able to open the door all the way in order to pull the drawers out and clean under them. The fridge was old when we moved in, so you can imagine the ickiness that lay beneath. This, plus the rattle every time the motor shuts off has me saving my pennies for a new stainless steel model. But this wasn’t the only design fail. Our prior resident also chose to place their stove directly across from their fridge in about a six or seven-foot space. So the fridge and the oven door could not be open at the same time. This is a problem when you have a big family. People are in and out of the fridge all the time while someone cooks. A third pet peeve in my kitchen is the royal blue laminate counter-top. I’m sure the person who had the big idea to put the fridge and stove across from each other—three feet apart—must have bought it from the clearance heap. 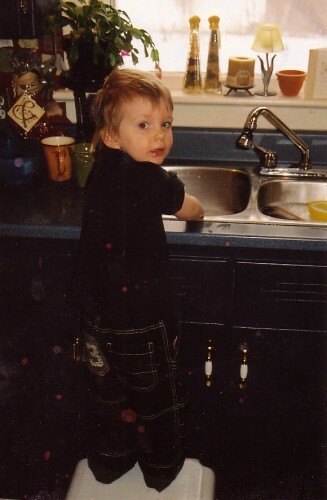 This kid is 13 now, so just imagine how long the counter and the cupboards have been dark blue. My budget solution was to paint everything blue so you wouldn’t notice the counter. Har, har. Yes, I know it’s dumb. Why would someone who doesn’t like the blue counter paint everything navy? I dunno. It seemed like a good idea at the time. And that’s the way it’s been for eleven years. Me complaining about the fridge in the corner and the ugly blue countertop. We didn’t want to spend a lot on renovations, because we don’t live in a major centre where housing prices consistently rise and makes such investment worthwhile. So we decided to fix only the important things which would save us money in the long run. A major addition to the back of the house or finishing the basement was a huge investment which we could never afford and might not recoup, anyway. Therefore, no $40,000 TV-style kitchen reno for me—the kind where the host rips out walls and moves the plumbing and installs new cabinetry and you, the owner, cry for joy at the sparkling end. Lo and behold, IKEA’s cheap and cheerful inspiration comes to the rescue. I saw one kitchen vignette I thought I could incorporate into my own home, and all I had to do was paint and move items around, including the hated fridge. See the chalkboard paint? Looks like an empty refrigerator-sized hole to me. They sure know how to sell you. It sparkles. I came home from vacation in Montreal and promptly moved the fridge across the room to an empty wall the very next day. My kitchen was designed to be eat-in, so two walls have cupboards and the other two are empty—they’re meant to host a breakfast table. We are all used to seeing refrigerators set into a bank of cupboards, so it looks weird, but at least the doors open all the way and therefore I couldn’t bring myself to squeeze it back into its hole. Instead, like my inspiration photo, I intended to coat it with chalkboard paint and maybe place a counter-height cabinet there for extra storage. This part is not finished—please stand by. A friend added a 15-amp outlet for me, because there was none on the intended wall. (1950s houses have far fewer outlets than are installed in new homes—I guess we are hungrier for electricity than we were back then.) I freshened up the paint on the walls and changed the colour on the cabinets. And I painted the counters. I’ll show you the countertop product I purchased from the Benjamin Moore dealer in my neighbourhood. It’s called Giani Granite, a paint kit for laminate and Formica© countertops which simulates various styles of mineral stone. I chose one called White Diamond. After the application of black primer, paints and varnish using sponges and rollers, the finished product was supposed to resemble shiny limestone with ribbons of gray and gold mica. Now, back in the nineties, Canadian TV reno star Debbie Travis made painting your old crap to look like something else very popular: Venetian plaster, aged copper, sponged walls and plaid floors. Anybody over 35 knows what I’m talking about. I owned her book called “The Painted House,” and embraced the trend with my whole heart. It was cheap and creative and fun. After a few years, this design style fell out of favour and I consequently got rid of the book and painted my sponged walls one plain colour, but this countertop kit tells me such trickery is making a measured comeback. Ta da! Looks okay. Let’s see how long it lasts. -At around $100 CDN, the product was cheaper than buying new laminate and paying for installation, and is probably no more expensive than buying each paint element separately. -None of the products smelled at all and dried very quickly to touch, although the instructions didn’t say how long the varnish needed to cure. –There was just enough included in the kit to do my kitchen, although I have a less than average amount of counter space. The box claims to do 35 square feet. –The product is flexible. You can add your own acrylic paint colours to the design motif if you wish. –So far, the paint job fooled at least one person. Either way, it’s not blue anymore. –It suggests using clear caulking around the sink to prevent water seepage, which would lift the paint and varnish. The can of varnish provided enough product for three coats. Much more, and the varnish would turn yellow anyway, marring the paint job. More varnish isn’t necessarily a solution. We’ll see how that goes. –How durable it is remains to be seen. We were never particularly careful with the old blue laminate. We often put hot things on it and didn’t always use a cutting board and neither heat nor knives seemed to mark it too much—it was ugly but tough. (I sense some symbolism. Gotta be a lesson in there somewhere. Let me think for a while and get back to you.) However, real granite, slate or marble counters need to be protected also, despite their hefty price tag. So I guess we’ll have to get used to using hot pads and cutting boards. Today, my husband took his lunch hour to run to the store and buy more adhesive so he could continue installing some fake stainless steel wallboard as a backsplash. But the walls aren’t straight and the glue was not adhering properly. Much scowling, muttering and slamming of tools ensued while the wallboard continued to slide downward, out of place. He raised an eyebrow in silence. The scowl remained. Yes, this is what inspiration brings: a little frustration and inconvenience, but a change everyone can enjoy—for another 11 years. Thanks, IKEA. *This is not a paid product endorsement. I simply like to share my life indiscrimately. This entry was posted on Wednesday, August 24th, 2016 at 4:40 PM and is filed under Life. You can follow any responses to this entry through the RSS 2.0 feed. You can leave a response, or trackback from your own site. Yes, inspiration can be pricey, in energy and time, if not in dollars. You did a great job; it looks fabulous! I’m wondering if there is a food-grade polyurethane that you could apply over your varnish, as that product is tough as nails, once enough coats are applied. The brother of a friend of mine put eight coats on an antique table, allowing his sister to be able to place her hot teapot directly onto the surface.